What a surprise to visit an African Water Hole with Irene Latham! 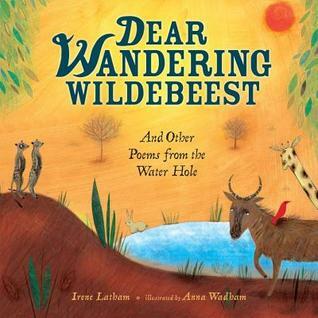 The fifteen poems in this picture book introduce us to the importance of the water hole to the African grassland ecosystem. Each poem is accompanied by a short bit of nonfiction text that tells more about the water hole or the animal featured in the poem. Working alone or in small groups, I can imagine students using this book (and others like it that combine poetry and nonfiction) as a mentor text for their own writing about an ecosystem, their neighborhood, or the cultures they are studying in social studies. Poetry Friday Roundup host/hostesses are still needed in July, August, November and December. Sign up here. This is SUCH a lovely, fun book! I've read it once and have it on my "reread and feature close to pub date" shelf! Hooray for Irene and her beautiful book! Reading the words "watering hole" while I'm thirsty -- nice. ;-) Happy Friday! I love nonfiction poetry books! I just received a Wildebeest postcard from this book, direct from Irene. Looks perfect for science/poetry roundtable discussion...thanks for highlighting it! I'll have to write up an order card for the library on Monday! Thanks for the early alert! I love the title. I'm looking forward to reading it. Thanks for the review, Mary Lee. Thanks for the sneak peek, Mary Lee. I'm delighted I'll be spotlighting Irene and this wonderful book on my blog this September! I was happy to get an early peek into Dear Wandering Wildebeest, and love the array of structures, the word-crafting, the blending of original language and a nonfiction theme. And a perfect pairing of pictures. Much to celebrate! Thanks for these three reviews - all sound really good. The cover illustration is lovely, and what an unique subject to write about. I can see kids liking it. Aww, belated thanks for reading, Mary Lee! The water hole is certainly a unique ecosystem, and i enjoyed writing the poems. Fun to see them making their way into the world!